The carpentry tool exhibit consists mostly of tools from two collections of local carpenters. Frank DeKelver was a carpenter who built houses on VanBuren Street in Green Bay, WI before he came to the village of Pike and built the DeKelver Exchange Hotel. He moved his family there on May 3, 1889 and continued to run the business until the closing of the Amberg Granite Company. It is likely that many of his tools in the collection were used in the construction of the hotel. 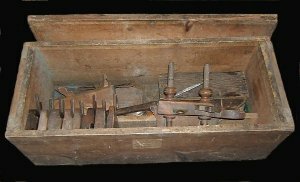 The John Beck collection of tools includes three toolboxes of early twentieth century tools and a few late nineteenth century tools handed down to him by his grandfather. The exhibit also contains some unique tools such as a broadax, turning saw, chamfer knife, and other woodworking tools of interest.